Strumica, one of the biggest cities in Macedonia, is located in the valley of Strumica in southeastern Macedonia. It's located on 149 km from the capital Skopje and from the nearby city Štip, is just 66 away. Strumica is located 239 meters above the sea level. The population of Strumica is Macedonian only and counts 34,442 residents. The climate in this part of the Republic of Macedonia is temperate Mediterranean. By the valley of the Strumica river, which flows in the Struma river, the city is connected with the Aegean sea. The residents of Strumica and the entire region have hot summer and cold winter. In summer the temperature goes up to 50 degrees and in winter down to -20 degrees. Due to the valley and the climate, Strumica is center of production of agricultural products like, peanuts, sesame, tobacco, and various fruits. And also here is the produced the famous drink called Mastika. The history if the region of Strumica, dates even from the Neolithic period, but Strumica as a town is first mentioned in the 5th century BC, when was settled by the Thracian tribes. Also in the Hellenistic period, during the rule of Philip 2nd and his son Alexander 3rdof Macedonia, the Strumica region was divided between the ancient Macedonian state and the other stayed to the Thracians. 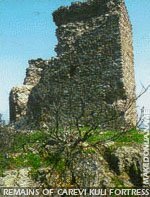 In the Roman period the region of Strumica went in the borders of Upper Macedonia. The biggest town was called Tiveriopol. When the Slavs arrived they changed the ancient name Tiveriopol to Strumica. A fortress was built right to the city, which stays in ruins today called Carevi Kuli. Carevi Kuli is a fortress from the late ancient period. It is located on the southern side of Strumica. It has size 100 meters and is oriented east-west. The all region of Strumica was settle by the Slavs in the year of 630 AD. This Slavs were different from the other they mixed with the ancient population and got the name Macedonian Sclavinii (Sclavinæ). Near Strumica was played the battle between the soldiers of Tzar Samoil and the Byzantine emperor Vasilius 2nd. 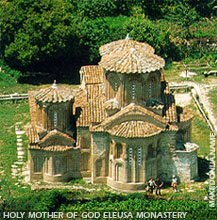 The monastery of Vodoča in Vodoca is one of the most preserved monuments from the Slavic period. It's claimed that in this monastery St. Clement held education and worship. After the fall Samoil's Empire, Strumica got under Byzantine rule and later by the Serbian. In the period after 1395 Strumica falls under Turkish authority and by them it was held for 529 years until the Balkan wars in 1913. Then went in the borders of Bulgaria and later after the first world war in Serbia. Strumica, which was city in central Macedonia, now became a bordering city to Bulgaria. After the Balkan Wars (1912-1913), the city became a part of Bulgaria. In 1919, according to the Versailles Peace Treaty, the Strumica district was included in the newly established Kingdom of the Serbs, Croats, and Slovenes. Strumica had extremely big damages during the period of the two world wars, when it was burned and bombed. Today Strumica is one of the most important cities in the Republic of Macedonia. Near Strumica are field of vegetables, and plenty variants of fruits. There is no airport and no train in Strumica, but can be entered by car. The border with Bulgaria is 22 km from the city, where the soldiers of Samoil were fighting against the Byzantium emperor Vasilius 2nd (The battle of Belasica, July 29th 1014).